David Douglas School District No. 40 is located in East Portland. While entirely within the city of Portland boundaries, David Douglas is a separate school district from Portland Public Schools. 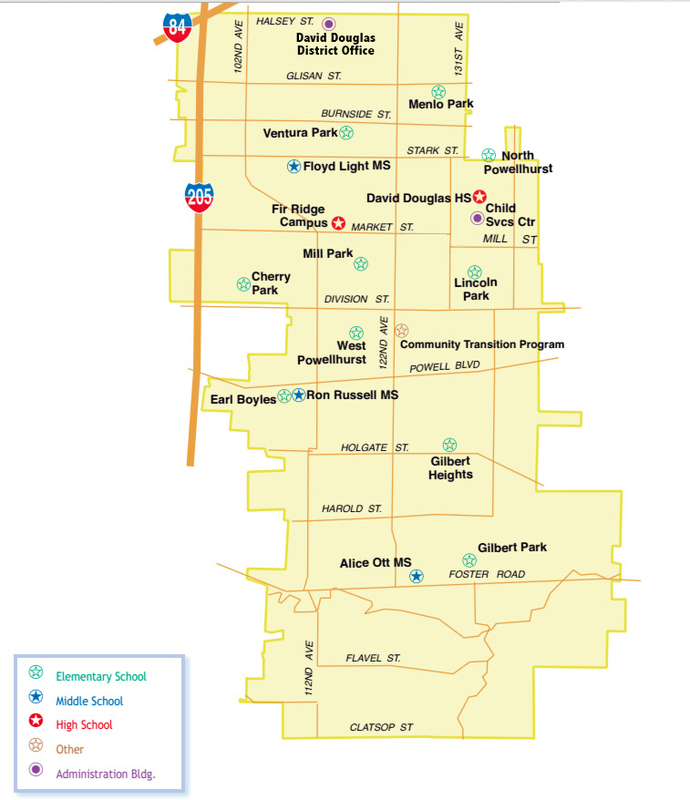 David Douglas School District covers 12 square miles of family homes, apartments, shopping centers and small businesses. It serves a community population of approximately 53,775. The David Douglas School District was formed in 1959 from three elementary districts — Gilbert, Powellhurst and Russellville — and the David Douglas Union High School District. The District now includes nine elementary schools for grades kindergarten through 5, three middle schools for grades 6 through 8, one comprehensive high school for grades 9-12, and one alternative high school campus for grades 9-12. The David Douglas Aquatics Center and Howard Horner Performing Arts Center are located on the campus of David Douglas High School, but both facilities are available for public use. View a DDSD promo video! The following maps show the overall district boundaries as well as each school’s boundaries. All students living in the David Douglas elementary and middle school boundaries attend David Douglas High School.